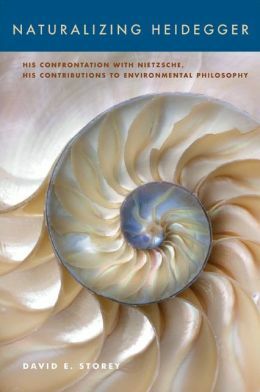 In Naturalizing Heidegger: His Confrontation with Nietzsche, His Contributions to Environmental Philosophy (State University of New York Press, 2015), Assistant Professor of the Practice of Philosophy David Storey proposes a new interpretation of Heidegger’s importance for environmental philosophy. Primarily drawing on Heidegger’s engagement with Nietzsche, but also on his readings of Aristotle and the biologist Jakob von Uexküll, Storey focuses on his critique of the nihilism at the heart of modernity, and his conception of the intentionality of organisms and their relation to their environments. From these ideas, a vision of nature emerges that recognizes the intrinsic value of all living things and their kinship with one another, and which anticipates later approaches in the philosophy of nature, such as Hans Jonas’s phenomenology of life and Evan Thompson’s contemporary attempt to naturalize phenomenology. This entry was posted in Boston College Authors and tagged environment, ethics, Philosophy Department. Bookmark the permalink.